In the day’s Gospel reading, from Chapter 4 of St. Mark’s Gospel, Jesus calmed the storm threatening the boat carrying him and the apostles on the Sea of Galilee. That boat symbolizes the church through history, said Archbishop Lori in his homily. He was the main celebrant at a Mass to open the U.S. bishops’ fourth annual Fortnight for Freedom. Almost 1,000 people attended. American Catholics don’t suffer the same threats as Christians in Libya — where Islamic State militants committed that atrocity — or in Syria, Iran or Iraq, but they are in the same boat, he said. 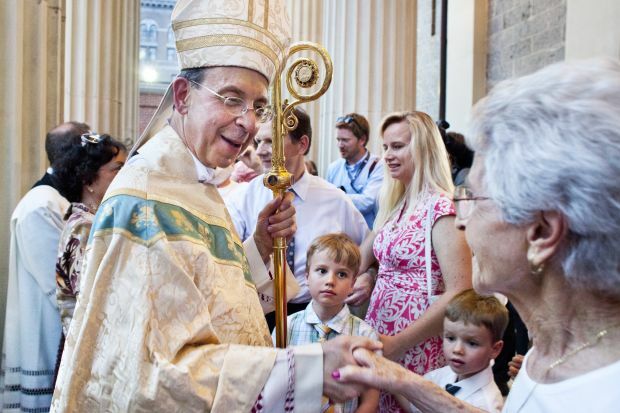 Archbishop Lori is chairman of the U.S. Conference of Catholic Bishops’ Ad Hoc Committee for Religious Liberty. In facing the “unchartered waters” of the current political and social seas of life, the archbishop returned to the turbulent Sea of Galilee. Auxiliary Bishop Denis J. Madden of Baltimore and Bishop Paul S. Loverde of Arlington, Virginia, concelebrated the Mass along with a number of other priests. Cardinal Edwin F. O’Brien, grand master of the Equestrian Order of the Holy Sepulchre and a former archbishop of Baltimore, presided. Hoffman writes for The Catholic Review, newspaper of the Archdiocese of Baltimore.